London slips away behind us as we head north and east. Back out through suburbs served and invented by the tube. Slow traffic. Red light disappointment. Green light anticipation. Creeping past houses with small gardens and smart cars. Paused before shops with ghost signs, showing generations of economic change; markers of waves of migration that has made this place what it is today. 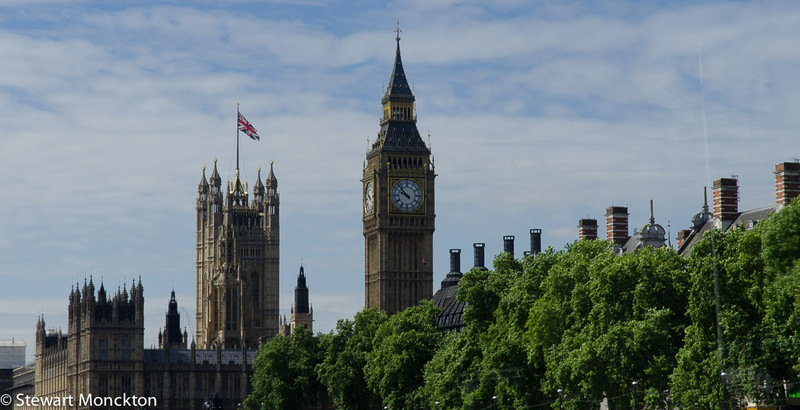 How easy would it be to map the history of London by looking at the names of shop owners and the brands of the products they sell? Post war migration, postcolonial economics, suburban decay and gentrification told through shop fronts and label fonts. We move out past the ring fence of the M25: a boundary in both directions. How many of those inside look beyond the pale to greener lands – an escape to the country – and how many outside look inwards towards activity, jobs and mythically lined streets. Sitting in stationary traffic brings far more questions than answers. The spaces between the houses start to grow. Fields, long unploughed, ringed with falling wire fences, back onto new housing estates and dormitory houses. Tall grass grows beside the fence posts and the wires sprout occasional plastic bags. This hinterland – neither rural nor urban – is strange to travel through; it looks unloved, yet full of possibility. Edgelands. Unofficial Countryside. Places that fail the categorisation of the worlds they border yet are home and hearth to many both wild and tamed. Few who live on either side of these places pause within it. It’s a zone of transmission and transience. It’s a zone often as unobserved as it is unloved. Horses stand with their backs to the wind. Magpies, more blue than black, and midnight crows find a living here from the wastes of others. Pairs of mothers pass an hour pushing their children in buggies. We are passing through, and they seem to be going elsewhere as well. It’s a land of change and transit. We take the road to Norwich. The fields grow greener. Small woodlands, once in the distance, now push at the roadside. We pass the county boundary; Norfolk. I know less of this place than even London, having never been here before. The England I knew was west and north, hills and mountains of sorts, the domain of oak, damp with winds and rain from the Atlantic. This east is different. Flat. Fertile. Fenland. Fast formed and flood wracked by season. A landscape more made by man than many. A landscape that turns around the far and obvious spires and towers of churches. And a landscape, distorted by six months of growing excitement, which is home to fish of many species. Walnut Tree Cottage looked wonderful on the web, but an address of “Main Road” has me worried. The naming tree sits to one side of the crunchy gravel drive and is paired with a huge mulberry tree behind the house. The berries are ready to fall, the nuts await autumn. And it’s almost silent. Sparrow cheeps, swallow twitters and the rattle of stones scattered by a pup of a dog called Tudds don’t count. After about ten minutes it occurs to me you could probably play family cricket out on the Main Road and be in little danger. I assume that this was a Main Road in the days when horsepower ate oats and spent the night, curry combed and washed, in stable outbuildings. But today it seems just an honorary title. We move from modern car to a 17th century house, with welcoming hosts, and most welcome tea. The rooms are historically small, cool in summer, snug against the eastern wind of winter; wooden stair steps that speak now and then, flags solid and foot polished on the floor, low ceilings and double filled bookcases with a section of maps and walking guides. This could have been the house I was born in, except this one had functional heating, hot water and plumbing that worked. And if anything else was needed to show this was a here and now very different from that then and there, a splendid breakfast appeared everyday, spread over a table covered with cloth and furnished with fruit, toast and jam. Our hosts seemed visibly disappointed that we never took up the offer of a cooked breakfast to line the stomach – and the arteries - against the risks of the coming day. I concede that may have been a mistake, but my doctor would have approved. In the warm dull hours of late afternoon we head north. Here, with almost mapmaker precision, the coast runs due east/west. Facing out into the North Sea, this is an area of fierce winter storms and winds made sharp by the shallow, cold water. And surprisingly along this coastal fringe lie a number of holiday towns. Or at least towns that in years gone by would have aspired to that title. Towns that flourished before people fled their pebble beaches and summer rain for the Spanish Costas. Towns emptied by package deals from Luton airport and Thomas Cook. Towns with long piers and promenades, both of which allowed you to walk to nowhere in particular, and having got there, turn around and walk back. Cromer seems to be a town split in two: away from the sea the streets are straight and wide, meeting at right angles, giving views of nothing much more than the other side of the street. The houses themselves look solid and heavy, adapted to the cold winter winds, but over built for a warm summer afternoon. They look like prime candidates for bed and breakfasts, hanging on against economic downturns and the tides of fashion. But there are few signs in the windows and none in the four square garden blocks; the streets look old and tired. There are no people to be seen. The streets look closed. Down towards the sea the character changes; streets meet at odd angles and pubs and cafes occupy corner blocks. There are more, but not many, people. They look in shop windows and wonder out loud about the choice of haddock or cod. Later experience suggests that the best choice would have been neither. The streets, clean, bright and oddly empty, center on the flint built church, where rounds are cobbled into straight lines and sharp corners. The graveyard is wild with flowers, bright and real in a way that the town seems not to be. Yellows and reds against the grey stones. Life in a place of death. A strange source of possibility for a town down on its luck, swimming against the tide. 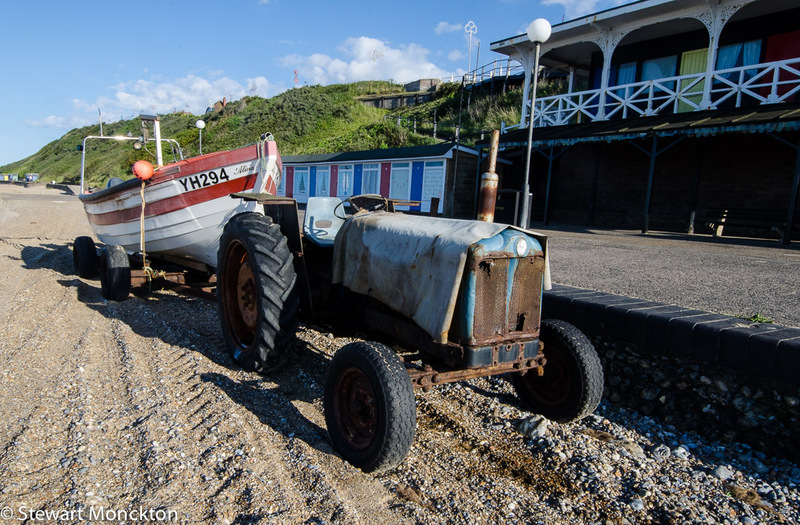 The beach itself is the best part – flint cobbles and crabbing boats, pulled up against the wall by rusty old tractors. This is old but alive, fading but active. We pile stones one upon another, tower building in the Goldsworthy style. Large to small, the uneven stacked back to back to form a kind of stability. One flint seems to have a worked edge. Is this just a fluke caused by the random collision of sea stones – or was it worked by an old, old hand when the cliffs were hills overlooking grasslands and the sea was distant? If the stone was a tool, and I think it was, it seems strange to hold in my hand a blade from the time when all things started. An artifact from a culture that dealt with change in ways that are not open to us. In a town that might be at the end of its time, I collect a sharp stone that has been tumbled and turned, edged and held from the distant past. My stone tower topples. The wind chills as the sun sinks. It’s time to leave. Cromer faces great challenges, but somewhere between the growth of its flowers and the roll of its stone it needs to find a way forward. Later in the week we return to this stretch of coast – and forewarned we decide to avoid the seaside towns, and head for wilder coasts. At Holcombe a wide expanse of sand sits between pine trees and the sea. In the trees shredded cones suggest a healthy population of squirrels, and on the beach footprints are over written by hoof marks; the flat sand an inviting walk or an exciting canter. The kids choose the sea, and I choose a more inland path. We synchronize watches, agree a time and a place to meet and go our separate ways. My footpath wanders along the boundary of the pines and open fields. Dark places to my right and open bright fields to my left. Butterflies seem to favor the left, where more flowers bloom and the sunlight warms their wings. On my return journey this pattern will be reversed, but the outward leg suits my state of mind, and makes me smile. The pines are not dark enough to be Mirky, but they are uninviting. A path through brambles – for once not a weed in need of control – allows me to look over the fields and hedges to my left. A large brown bird drifts into view from behind one of the hedges. Lazy unconcerned flaps and long glides. Wings held in a shallow vee above its back, a hunter’s dihedral; a marsh harrier. Soon a darker bird, with the same flight and grace, joins it. The first bird pairs and quarters with the second and even I can hear the startled calls of the small birds they pass over. The dark bird slides from view and its pale companion keeps hunting. Flap and glide. Flap and glide. Slight changes to the angles of the birds wings sends it twisting down towards some unseen prey. Gone. Not so long ago this would have been a remarkable sight, but this is a bird that is fighting back against the tides of landscape change. We have bought cheap reliable food at the price of small and ragged places, unkempt corners and the homes of March Harriers. Riches and security come at a high price, but have uniform, unblemished apples and out of season fruit been bought at too great a cost? Full stomachs (for many, but never all) sit below minds robbed of the possibility of chance encounters, wild encounters. Hunger is not ennobling, but neither is the loss of wildness and contact. The harrier reappears from the long grass, an unidentified ball of fur or feathers gripped in its talons. The rough lands near the sea feed two needs. Back on the path White Admirals rest in the summer sunlight. Time rushes past; with the tower bird hide not yet in view, I walk faster. The steps up to the hide are steep, mossy and a little greasy; the door creaks as it opens. I’m surprised to find someone else in there. I’m even more surprised that he seems to be marking exam papers; I recognise the disappointed sigh as he reads another answer that seems to miss the point, or was written by somebody who missed the class. I say “hello”, but he does not even look up. He must find marking even harder than I did. A harrier drifts past in the distance. Ducks – mallard – pladge in a pool of shallow water in front of the hide. My companion sighs again. A few hundred meters away a deeper pond holds more duck, coot and a lone grey heron. At the back of the pond – at the extreme range for comfortable viewing – are a group of white birds. I expect them to be egrets, a bird that has only become regular in England in the years since I left in the 1990s. For me a group of these birds would have been highlight enough, but even at an uncomfortable distance it’s clear that these birds are bit egrets. Unconsciously helpful, one of the birds moves a little closer and holds its head so the bill becomes a silhouette. A long bill that bulges at its end to a round disk – the birds are spoonbills. There are at least eight birds, possibly more around a corner in a hidden part of the pool. The birds feed in loose groups of twos and threes, sweeping their spoon bills through the water, taking in the thick parts of the summer soup. I find the silence of my companion difficult, and I ask if he has seen the spoonbills. I get a single syllable reply; “yes”. I look back to the spoonbills just in time to see the marsh harrier fly over them. Neither seems to notice the other. Here in one flooded field we have recovery and expansion. Both are caused by human change. The harrier, the beneficiary of conscious change, the spoonbills inadvertent, but well understood, change. We plant trees in unfarmed corners and turn off the herbicides in the headlands of our wheat, because we can see what happens when we do. But when politicians look to the skies they seem to see nothing at all. Just empty space and next week’s polls. 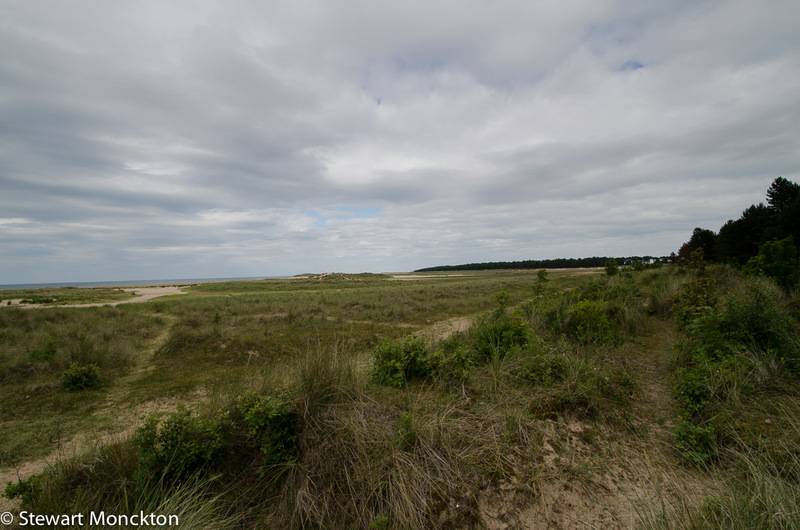 As the seas creep up, and the storm rains flow down, places like Norfolk become the battleground of climate change. Many acres here and in other low lying places may have to be abandoned soon as the cost of flood and tide defences grows and grows. The harriers and spoonbills will do well from this – but what will it really mean if we give up this land to the sea? What will it really mean, when we redraw the maps and the people move on? 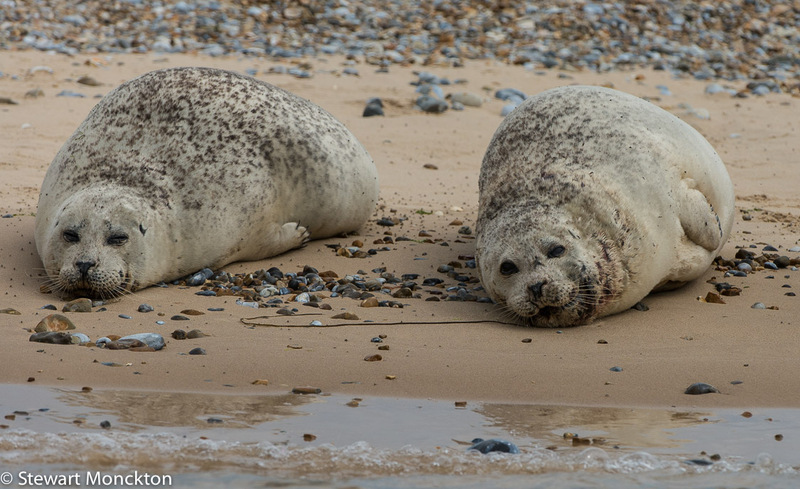 Further down the coast seals – common and grey – haul out on sandbanks. Never has a creature looked so much like an inflatable pool toy. They watch us watching them. Terns and oystercatchers tend to the summer business of parenthood, some chicks still in the nest, some running in the water and some still inside the hard shell of their eggs. In the creeks and small river mouths boats sit at anchor, clipped to floating buoys. One of the boats looks like a strange combination of Ark and Garden Shed, as if the upper part of the boat has fallen on to the lower by accident. The next day dawns summer bright and clear. I would not have objected to a few clouds, but the weather was set fair. 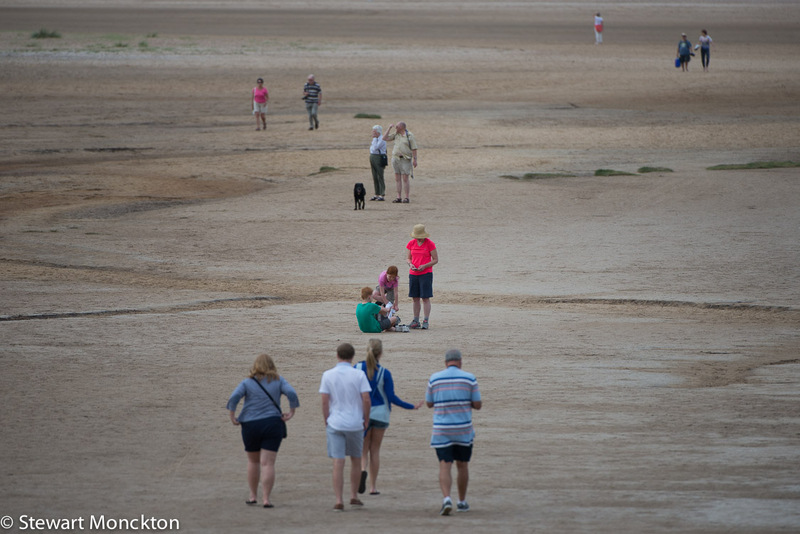 Daily temperatures make the front page of the papers and people speak of the long summers from childhood. It is early, but not painfully so, when I walk out of the front door and flush two wood pigeons from the Walnut tree. Fat and loud winged, the total mass of this species out-weights any other bird in the UK. This is the kind of thing I carry in my head. That most domestic of bird, the house sparrow, gathers in noisy groups on the gutters. From the trees behind the house, Jackdaws chack to each other. In the distance, I can hear the rough cough of a tractor engine starting. Weekend after weekend started like this for me in the past, up early to go fishing, wondering what, if anything, would happen over the next few hours. With the expectation of a canvas hat, faded down to colourlessness by the harsh Australia sun, my wardrobe runs to greens and browns. An annoyingly bright bag is slumped against the wall, but I know I could hide that in the bushes if needs be. In the past I would have had a flask of coffee with me, bitter and dark. But something needs to be left behind. I have been looking forward to this day for almost six months. This is the day I can go fishing. And it’s the kind of fishing I understand: long rods, fine lines, small hooks and fresh water. A car rolls in from the east, with a face I recognise, but have never seen, behind the wheel. I had spoken to John the day before, as he battled his way through nettles towards a river, hoping for barbel. As a kid I had read the things he wrote, and wondered what it would be like to catch that many fish; to catch fish that big. Today, he is going to help me catch tench, a fish that had filled many June mornings in the past. The inside of the car is full of gear. Criss-cross rods and tackle boxes. Dozens of apparently identical yellow plastic bags. Buckets of bait, and abandoned paper bags that once held lunch. It is the kind of scene produced either by an explosion or a month of continuous fishing. Thankfully, it is due to fishing. We talk as we drive down country lanes, finding common ground in nature and fish. It wis weird to meet a stranger and to feel comfortable so fast, a common goal and a shared vocabulary a clear advantage. From the back of the car comes the familiar ticking of rod tips tapping together in response to bumps in the road. The flat lands of Norfolk have not always been as peaceful as they are today – not that long ago they were studded with air fields that sent forth planes to protect or damage dependent on design. And the runways of the airfields were built with gravel dug from ground; the ancient spoor or glaciers and rivers, mixed and poured to bring forth fire and death. And in the flooded holes this left behind a gentler life now thrives. The edges have been softened by willow and reed, the shallows are studded with water lilies, classically awaiting a sitting frog. And there are fish. Hopefully there are a lot of fish. In a wonderful example of the process beloved of Intelligent Designers, order arises from the chaos in the back of the car. Rods are chosen and strung with line, hooks are tied and baited. How many hundreds of times I have done this? I take a rod to the water’s edge and cast, and place the rod on the rests. I tighten the line and wait. I feel a familiar combination of anticipation and stillness, the first front and centre, the second growing by the minute. People say that fishing is dull, but these must be those who cannot drive without the radio and have yet to learn the value of stillness. The line on the rod flickers upwards, brief and small, and my hand hovers over the handle. Nothing else happens. It was probably a fish colliding with the filament line between reel and hook. This is a time machine. I could be 15 again, but my hair is shorter and my mind clearer. A Kingfisher electric blues across the water while a family of Great Crested Grebes fish in the shallow water to our right. They are catching no more fish than we are. On the other side of the water a heron stands motionless, a grey shadow against the green bank. Terns, wonderfully white against the blue sky, call with sharp, shrill voices and leave the scene with tiny silver fish. Somewhere a hungry youngster will be pleased. It’s probably a good thing my kids are not relying on me to provide a fish supper. After an hour of near complete stillness we move to another, smaller pond. I have no idea what makes a lake a lake and a pond a pond, but I think this is a pond. Under a willow tree, almost a fishing cliché, I fish for tench. A thick topped, red float sits in the mosaic reflection of the branches. 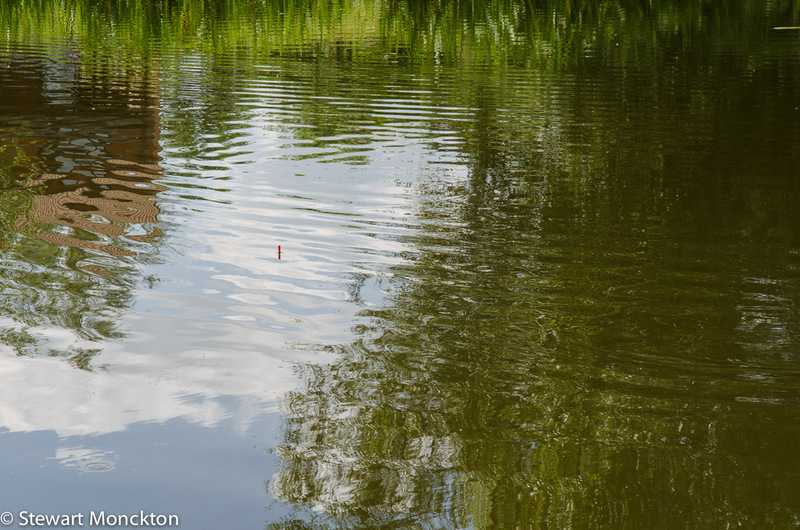 Patches of tiny bubbles break the surface, the signature move of my intended catch, and anticipation builds again. Small fish nibble. The float twitches and dances. I feel my hand tighten around the handle of the rod. My feet serve as a rest for the rod. There remains something special about fishing with a float. The process is pure memory and deliberate simplicity. Eventually the float lifts slightly, slides sideways and disappears. Classic. The fish heads for the sanctuary of weeds and I cup my hand over the reel to slow its escape. Much to my surprise this succeeds. I feel the fish circle with heavy intent. I feel the rod spring straight. The stored energy of the bent rod launches the float back towards me. Gone. At such times there is a great need to embrace stillness, and strangely I can. I have said before that fishing is about more than just catching fish. And if ever this needs to be true it’s as I wind in the slack. Little bubbles of slime coat the line where it rolled over the flanks of the fish. Things happen, most are of no real consequence, many make us angry; but often there is little justified link between the cause and the effect. I remember the anger this would have caused in the past, as if it really mattered. A rage would have boiled up and stopped me from seeing anything but the straightened rod and the returning float. I rebait and recast, and once more embrace the stillness. It seems the natural thing to do. A large blue dragonfly lands on the tip of the rod and rubs its eyes clean with its legs. It’s important to be able to see clearly. I stare at the float, a little patch of red in green, but it stays where it is. The moment has passed. It’s time to move on again. Around the corner, in a shady part of another lake, carp can be seen cruising just below the surface, slurping down floating goodies. A plague fish back home, here they are treated with a reverence akin to religion. People set up temporary shrines on the bank side, with beautiful matched sets of parallel rods and space age bite detectors. Serious carp fishers are a breed apart, a sub-cult of fanatics in an already fanatical team. I used to want to be one. With the kind of sensory perception worthy of a deity, the carp seem to be able to sense the presence of a hook in the floating goodie attached to my line. All around my bait rubbery, extendable lips engulf otherwise identical snacks. Eventually my bait is sucked under and I connect with a fish. It seems rather small compared to the fish round it. It seems a rather different shape to the fish around it. It turns out to be some form of hybrid, and John does not even bother to put a net under it – he holds the line near the back and shakes the fish off. I had hoped for more from my first British fish on the 21st century. John notices my disappointment – but he has a point! A few casts later I actually hook a carp, which, with a kind of growing predictability, throws the hook. How can this not feel like defeat? How can this feel like such a genuinely splendid day, when I am, to all intents and purposes, failing to do what I wanted to do – which is catch fish. Is it pure nostalgia? Is it the outlandish green of the vegetation, the reflections on the water, and the birdcalls in the bushes? Is it that I can talk about the things that are important, and in doing so come to have a better understanding of their value? Or is it just that I have a day to myself, to things I want to do – a rare treat for a parent. Or is it all of these, mashed into a day that so far has yielded almost no fish, but a highlights reel of stories. The brief disturbance has scattered the other fish, and I think it’s time for a break and a bite to eat. Mallard pay us a late lunch visit and we talk of many things. But mainly we talk of people I only knew through their bylines in the weekly Angling Times or Mail, the monthly Coarse Fisherman or Angler; it feels like I am being introduced to ghosts. We leave the lake to the tricky fish and head towards the River Welland. Once more this is an echo of the places I used to fish – small and out of the way. We scatter a handful of sweetcorn – opened with a butterfly-handled opener – into two swims and wait a while. John goes in search of crayfish, an American invader that feeds the Chubb and makes then grow fat. I sit surrounded by tall reeds and flick a simple rig a little down stream. Once more I rest the rod on my feet, making a mockery of the amount of gear I used to carry. The rod tip bounces over once, and then folds round and I strike. The fish – as yet unseen – heads for the backside vegetation on my side of the river; if it managed to get any closer in it would have to get out of the river and climb a tree. I don’t know who is more surprised when I slide the net under a large chub – the fish or me. 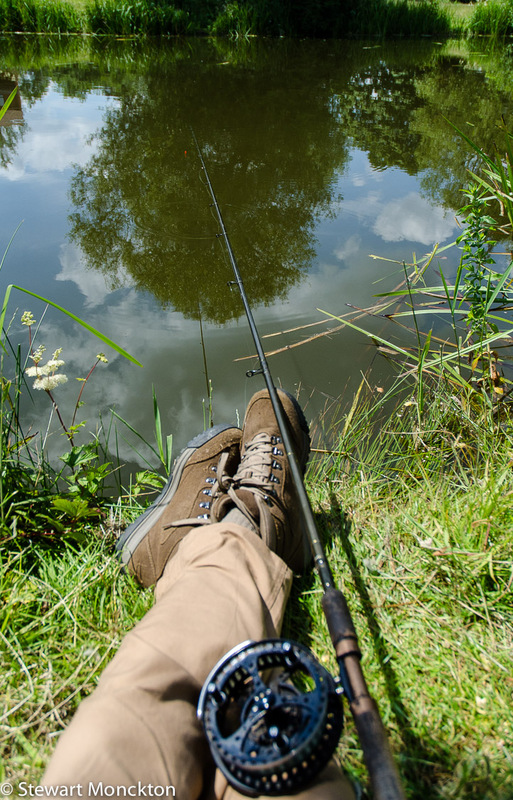 I notice that at some time between the bite and the net I have stood in the river, and water is running out of my right boot. It seems my mind was elsewhere. John returns, and if it’s possible seems even more delighted than me. The fish – the largest of this species I have ever caught – would push 5lb (maybe!). Although it would be at home on the other side of the country, I am grinning like the Cheshire Cat. Five minutes later and a similar sized fish sheds the hook inches from the net. But I am still smiling. The day ends and I return to Walnut Tree Farm. I tell tales and spin stories from the day. I don’t stop smiling. In Norwich Cathedral, just a handful of miles from where I was fishing, there is a famous sculpture of sorts. 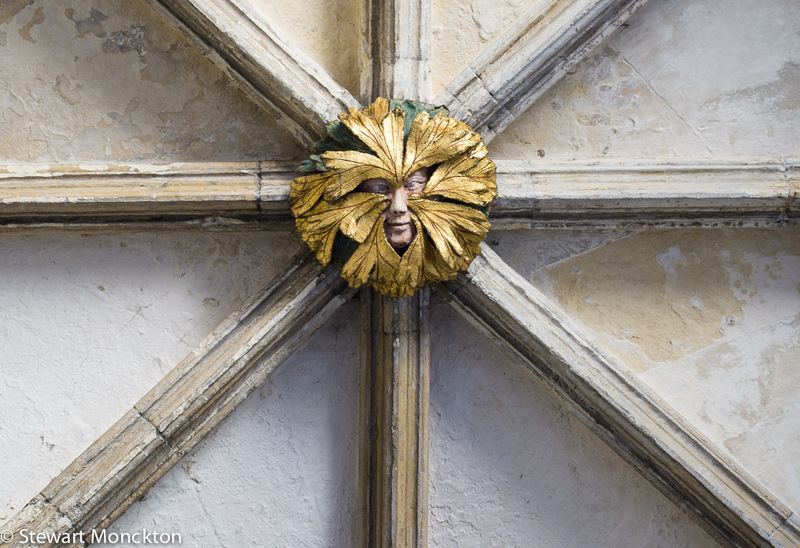 In the roof of the cloisters is a Green Man – a face looking out from behind a wreath of leaves. Many people think these faces are a representation of an old woodland spirit or sprite. A mischievous face from the green past of belief: on still days when I fish, I feel that it may still be out there, weaving magic and casting spells. I smile at this thought and smile about the ones that got away. I just loved reading this post Stewart! It's wonderful when an ex-pat can show me my own country in a different light. Thank you. A good read - and all about places I know like my own hand. I truly believe in the saying, "you go fishing, you don't go catching". I came from a fishing family and we went regularly when I was a child, but I haven't been in years. There's just something about standing on the shore with your line in the water, with your Mom and Dad and maybe a brother scattered around the way, all enjoying the peace and quiet, and hoping for that tug and the disappearance of that float. Thanks for the memory, Stuart. I love this post Stewart! I found you at your previous post about London and now you were in Norfolk (just down the road from Lincolnshire!). Just one thing, the M52 should be the M25 (or otherwise known as the 'Road to Hell' sung by Chris Rea). I had the misfortune of using it regularly - thank goodness I don't anymore! I was at Hunstanton a couple of weeks ago a few miles from Cromer, a Victorian seaside town that has its quiet spots as well as amusements. Thanks again for a great post. I will repeat my self but you are a great writer! Would you write books, I would read them!! As Richard puts it, it is a very interesting perspective on the country you were born in. My aussie son is leaving us today, back to Mackay where he lives on a boat... I dearly hope we can join him and his family soon! From another who grew up fishing.. this made me smile. I spent this afternoon dragging a kayak through beautiful forest to a protected trout lake in our area. I did not fish, but paddled around the lake and admired the clear water. I very much enjoyed your angler's miscellany, Stewart. a lovely travelogue - an area I have been to a little bit but not much. Love the green man in the cathedral. What a beautiful piece of writing! Many of those sentences sound like a long poem. I can see what you describe – your words have great power. I loved reading your post! Your red light disappointment and green light anticipation made me remember why I prefer small town traffic to that in Dallas. That's one cool old tractor and love the fishing shot. Your word pictures are lovely.